Although we are only a few months in I have filled, for what in years past would be, an entire year's quota for travel. I wrapped up 2016, and subsequently brought in 2017, with a trip to Tazania to visit my sister, Madi (IG: @coolbeanmadi), who has been studying and working in East Africa for just under a year. A few weeks after getting home from that trip, I hopped on a plane for a quick three day trip to Naples, FL for some late Winter sunshine therapy. While there, we stayed with a friends grandma, and although we may have brought the average age down significantly - the old folks brought the party. That leads me to the next trip which, was very shortly thereafter the trip to Florida. The plan was to regroup with seven of my college amigos for another long weekend of skiing, snowboarding and general mountain Tom-Foolery. Unfortunately, we were not able to reunite the entire band, but we were able to find a group of four to tackle the Rockies. The crew was rendezvousing from all over the country. We had John (IG: @theronjoberts) coming from Houston, Andrew (IG: @aschuch6) lugging camera gear all the way from Pheonix, Nathan (IG: @n8_schwenk) flying in from Knoxville, and myself from Indianapolis. The four of us had met at Purdue, all graduating between 2014-2015, and were trying our best to make a habit of this yearly trip. We had a group of eight last year in Park City, and if this participation trend continues, losing half the team each year, this is going to be a short lived tradition. Despite the decline in numbers, there was absolutely no decline in stoke for the getaway. 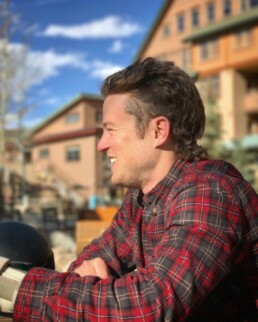 After having grown my hair out quite nicely over the six to eight months prior to the trip, I wanted to make a little noise upon my arrival in CO. The plan: a mullet. Flying out on a Thursday around lunch, I worked the first part of the day from home. This led perfectly into me getting the cut just before heading out to the airport, which is exactly what I did. Desean, at my local Great Clips, cut the quaff to perfection (after I pulled up several pictures to illustrate what a mullet actually was), and I left the joint feeling unstoppable. I immediately maxed the speakers in the car playing the Top Gun soundtrack and jet off to the airport. I caught my Southwest flight (because who else lets you fly a snowboard bag for free), and was on my way to Denver. I was set to arrive a few hours before the other guys, and had scheduled a van into the mountains. The host of the Airbnb, suggested Home James (www.homejamestransportation.com) for our transportation needs, which certainly did not let us down. I sat outside the terminal on the sidewalk waiting for my ride in 75 degree weather... This was certainly not what I expected for a ski trip. I get to the Airbnb, which I did not realize until I arrived, was in the Founder's Pointe Resort. The accommodations were very nice, we had a hot tub (which is absolutely essential) and were a short walk to the lifts. After settling dropping my gear off in the room, a bit famished, I set off into town to find food and a cold one. I hopped on the resort shuttle that met just outside of the Mountain Lodge at Fraser's Point, aka right across the road. The shuttle driver recommended The Peak, and really did not give me much choice as he dropped me off at the front door. Feeling a bit defiant, and adventurous, I did not head his recommendation and walked to the next closest place - Randi's Irish Pub (https://randiswinterpark.com/). I was greeted by a friendly bar tender as I bellied up to the bar solo, still waiting on the amigos to arrive. I got myself a green brew, this was the day before St. Patty's, and a stew. The beer, stew and company that I was in, were superb. As I was eating I started chatting with the absolutely RAD, Maria (IG:_mfgv). Home girl had just gotten off the Appalachian Trail and was gearing up for the PCT in a month. Keep up with her and her travels via Instagram. When the dudes finally arrived, an hour or so later, we greeted each other with the typical bro hugs and catch-up pleasantries. We caught a couple more brews and ventured back to the condo... we had a couple big days ahead of us. As I mentioned before, the weather in Winter Park was especially warm. We were seeing 50+ on the mountain, which made for very comfortable temperatures, but relatively sticky snow. That being said, the first day on the mountain was the coldest and had the best snow. They had opened the bowl at the top of the Panoramic Express lift up for the first time in over a week so, per the advice of a local, that is where we headed. We were all knocking off the rust of not having ridden in a bit and took our time hitting things too hard, at least the other guys were. I on the other hand bombed a couple runs, sent it down Forget-Me-Not into the trees, overcooked a corner, and went down hard on my left wrist. Mind you, this was before lunch, on DAY 1, I am such an idiot. The rest of the day went on as planned, sort of. I spent lunch with ski patrol, who told me definitely don’t continue to snowboard, got a wire mesh brace from them, and immediately returned to do what they said not to. That afternoon we took the same shuttle back into Fraser to the Safeway to get groceries for dinner. We whipped up an unbelievable amount of spaghetti, wolfed it down, and then, since it was St. Patty’s, returned to our local watering hole, Randi’s. We soaked in some live music, green beer and a bit of Jameson and ventured home exhausted from the day. Day 2 was pretty well a repeat of day 1, minus anyone getting injured. Since we had groceries we were able to pack our lunch, and with the weather being as nice as it was - caught some sun as we ate outside at Lunch Rock, mid way up the mountain. Day 4 meant traveling back to real life. I caught lunch and a few beers at the airport before my flight left, direct to Indy (bless up). I strategically sat myself next to the cutest girl I saw with an open seat next to her, thanks Southwest, for the flight. Maddie, from IU, was heading home from Salt Lake after some absolutely bad assery of mountain biking and skiing. Biggest mistake of the trip - not getting her number. So if there is any chance she is reading this, or anyone knows who she is GIVE HER MY NUMBER (317) 997-5157. Overall the trip was, of course, awesome. Stoked for next year!